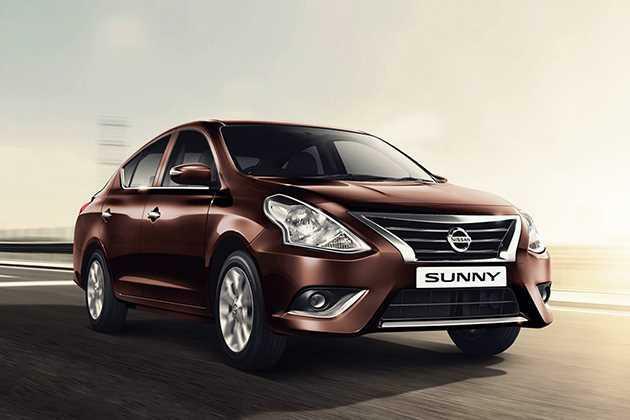 The Japanese car maker has launched the refurbished version of its luxurious sedan, Nissan Sunny in the Indian car market. It is available in three petrol and five diesel variants among which, Nissan Sunny XE is the base petrol variant. It is equipped with the same 1.5-litre petrol engine that has a displacement capacity of 1498cc. This engine has the ability of producing 97.7bhp in combination with 134Nm. It is incorporated with an electronic fuel injection system, which helps in producing a peak mileage of about 16.95 Kmpl (as per ARAI certification). It comes with major updates in terms of both exteriors and interiors. In terms of appearance it gets radiant headlamps, bumper, refined front radiator grille, which gives it a refreshed look. This sedan also comes with important safety features like anti lock braking system along with electronic brake force distribution, brake assist system and driver airbag. This model is bestowed with a robust suspension mechanism, which keeps it well balanced in any road conditions. The company is selling this sedan in six exterior paint options. The list includes Bronze Grey, Onyx Black, Blade Silver along with three new colors that are Pearl White, Deep Grey and Nightshade. On the other hand, it is offered with a standard warranty of 2-years or 50000 Kilometres, whichever is earlier. The sedan has a large body structure that is fitted with refined cosmetics, which gives it a stylish look. To begin with the rear end, it comes fitted with a radiant tail light cluster, an expressive boot lid and slightly tweaked body colored bumper. The large windscreen is integrated with a centrally located high mounted third brake light, which provides additional safety. On the other hand, its frontage is fitted with a pronounced radiator grille that is embossed with a chrome plated company emblem in the center. This grille is surrounded with a newly designed headlight cluster that is incorporated with high intensity halogen lamps and turn indicator. The body colored bumper has a wide air dam for cooling the engine. The windscreen is made of tinted glass and is accompanied by a set of intermittent wipers as well. The side profile is fitted with body colored door handles and black colored outside mirrors. The neatly carved wheel arches are fitted with a set of 14 inch steel wheels that are further covered with 185/70 R14 sized tubeless radial tyres. This sedan comes with an improved length of 4455mm along with an adjusted height of 1515mm and a decent width of 1695mm, which includes external rear view mirrors. It has a large wheelbase of 2600mm and a minimum ground clearance of 165mm. The fuel tank capacity is 41 litres and it comes with a spacious 490 litre boot compartment as well. The interiors of this Nissan Sunny XE variant comes with a newly designed dashboard that features a refurbished central console. It is further fitted with a manual AC unit and several other utility aspects like a large glove box and accessory power socket . The company has also tweaked the instrument panel, which further emphasizes the interiors. The spacious internal cabin is fitted with well cushioned seats, where the front seats have adjustable head restraints. All the seats are covered with fabric upholstery and offer ample leg space for all occupants. This variant has quite a few utility based aspects like a mobile charging facility, front power windows, remote trunk and fuel lid opener, boot compartment light, sun visors, three assist grips and other such aspects. It it also bestowed with an tilt adjustable electric power steering system, which simplifies the handling. On the other hand, it is incorporated with a multi-information display that provides information related to average fuel consumption, dual-trip meter, tachometer, vehicle speed, time, outside temperature, driver seat belt warning and other notifications. This newly launched sedan is equipped with a 1.5-litre petrol engine, which comes with a displacement capacity of 1498cc . It is integrated with four cylinders and 16-valves using a DOHC (double overhead camshaft) valve configuration. It has the ability to generate a maximum power output of 97.7bhp at 6000rpm along with a peak torque output of 134Nm at 4000rpm. It is cleverly mated with a five speed manual transmission gear box, which transmits the torque output to its front wheels. This sedan can achieve a top speed of 175 Kmph, while accelerating from 0 to 100 Kmph mark in just 15.8 seconds. This petrol motor is integrated with an electronic fuel injection system, which allows it to produce 16.95 Kmpl on the highways and 13.45 Kmpl in the city traffic. This sedan is equipped with an efficient braking and robust suspension mechanism. The front wheels are assembled with a set of ventilated disc brakes, while the rear ones are mated with solid drum brakes . This mechanism is further assisted by anti lock braking system along with electronic brake force distribution and brake assist. Meanwhile, the front axle is fitted with a McPherson strut, whereas the rear gets torsion bar type of suspension system. This variant is blessed with an electric power steering wheel, which supports a minimum turning radius of 5.3 meters. This Nissan Sunny XE is the base variant and is incorporated with a few aspects like key not removed and headlights-on warning lamps, manual air conditioning unit, 12V power socket, and follow-me-home headlamps. It is also incorporated with a multi-information display, drive computer, three assist grips, 3-bottle and cup holders . In addition to these, it has front power windows and anti-dazzling inside rear view mirror. This variant is incorporated with quite a few protective aspects, which includes seat belts for all passengers, an advanced engine immobilizer, door ajar warning notification, central door locking system and a centrally located high mounted third brake light. The company is also offering ABS along with EBD and brake assist system , which enhances the braking mechanism. This latest version also has airbag for driver, which further augments the safety quotient. 1. Fuel economy is rather decent, when compared to its competitors. 2. Advanced braking mechanism with ABS+EBD and brake assist. 1. Absence of music system is a big minus. 2. Price can be more competitive.